Discovered by a fisherman in early 1900s, this cave is one of the top attractions in Amalfi. Located just 4 kilometres away from Amalfi, there are many service operators that can help you reach to this beautiful cave. Weather permitting especially during summer, get onto a boat from Amalfi and arrive appreciating views of the city. Visitors can also reach this grotto with the help of an elevator – from the Coast road. 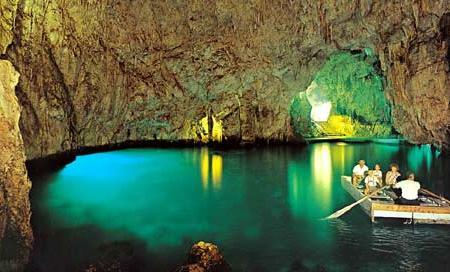 This grotto is named after the color that it reflects, as is a Blue grotto in Capri. Best time to experience it from 12 PM to 3 PM. Lather on sunscreen and don’t forget your camera! Visitors can either arrive by boat from Amalfi or get onto elevator from the Coast Road. Cave may not be accessible if the weather conditions are bad. 10 € if you would like to arrive at the Grotto by the boat. How popular is Grotta Dello Smeraldo? People normally club together Villa Rufolo and Spiaggia Del Fornillo while planning their visit to Grotta Dello Smeraldo.